Card Text Reap: Troll heals 3 damage. Flavor text Don’t feed it, it’ll go away. 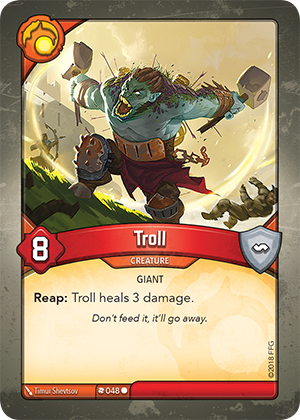 If I have multiple Trolls in play, can I use one Troll’s “Reap:” ability to heal another Troll? No. If a card’s ability refers to its own title, that reference is only to itself and not to other copies of the card. Therefore, if you had two (or more) trolls in play, their “Reap:” ability could not be use to heal each other, only themselves.